An empty run is unproductive for both a pallet and the planet. Virtual transfer and real delivery! A credit-debit system: a pallet account valid throughout Europe. Get access to an EPAL stock of 500 million pallets. We supply your needs at a given location at a predetermined time. Collection, sorting, and repair are all performed in our facilities. Due to the breadth and depth of its network, PGS guarantees collection and delivery of your pallets while limiting any empty runs: The closest PGS facility is used. 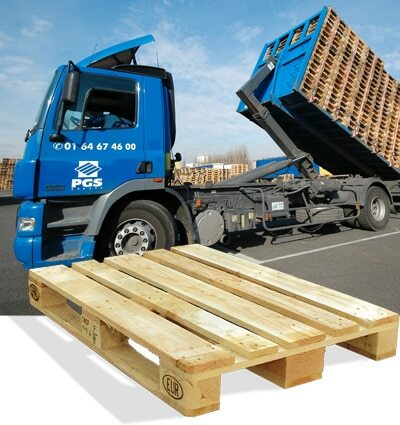 You can load your pallets in Paris or Berlin and return them to us in Barcelona or anywhere else in Europe! • Reduction in greenhouse gas emissions. • By creating your PGS RLS® pallet account, you credit it with a specific quantity of EPAL/EUR type pallets. The same contact manages your account nationally and globally. • You commission pallet delivery to supply your shipping sites, we deliver from the closest PGS facility. The number of delivered pallets is debited from your account. 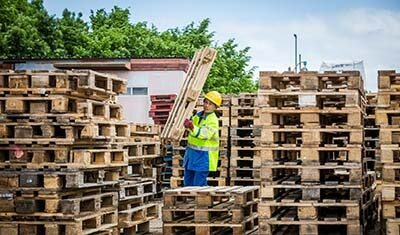 • You specify the place where the pallets can be picked up, PGS (always from the closest facility) collects them and your account is then credited with the number of collected pallets. Any «  pallet  » movement is the subject of a credit or debit operation in your account. You make no capital investment, you only spend the pallets that you actually use. Credit pallets to your account, make direct deposits to your shipping sites, and reload your account by specifying the collections that need to be made at the points of arrival. Delivered pallets meeting the quality requirements of your facilities. Relocation means collection, sorting and repair. A complete process that PGS has mastered since the founding of the company. Reusable, repairable and 100% recyclable, the wooden pallet represents - beyond a doubt - an eco-friendly solution in the package world. • Collection is carried out directly by our drivers who pick up used pallets from users. A collection bin can be provided. • The closest PGS facility processes them. 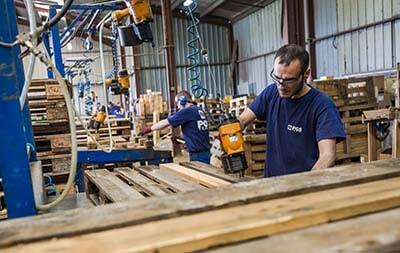 The extensive network of our PGS facilities in France and our certified partners in Europe allow us to limit to a maximum «  empty  » runs with your pallets. • Upon reception of the pallets at our facility, the pallets are routinely sorted and their condition inspected. • Pallets in good condition are re-introduced in the stores of the PGS facility that collected them. • Damaged pallets, depending on their condition, are repaired or recycled after removing the re-useable parts. • The broken pallets are sent for repair and the defected parts are repaired. This operation includes disassembly, nailing of new parts, and quality control. • The repairs are made according to EUR/EPAL, Dusseldôrfer standards. • Heat treatment in our ovens (56 °C/30 minutes) for export pallets, shipped in countries complying with standard ISPM 15. • Possibility for artificial drying (option) for uses requiring dry pallets.